Many software casino games providers means more games to choose from. NetEnt keads the way in table games, and the good titles can be found here. Crazy Casino shook hands with leading software developers, attached to that is one of the best welcome bonus in the industry. The result is an impressive assortment of slots, table games and video pokers that can be played on most mobile gadgets. 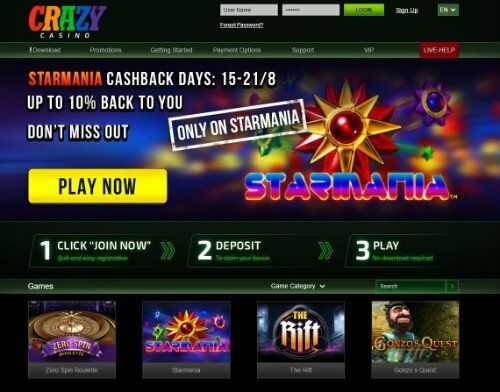 Crazy Casino knows how to make a powerful first impression by dazzling the eye of new customers. More than 700 games can be played here and they are unique and exciting. The brand is regulated by the respectable Curacao Gaming Authority that only offers licenses to trustworthy gambling operators. The games at Crazy Casino mobile version can be played on smartphones and tablets by all those who reside in a country where online gambling is legal. The casino would love to serve players from Turkey, Israel, Singapore. Unfortunately, these countries feature on the list of ineligible nations, so their residents need to look elsewhere for gambling opportunities. Crazy Casino welcome bonus is not only generous, but also well diversified and easy to claim. This is self evident as soon as you apply for the first real money deposit bonus. Signing up for a real money account opens multiple opportunities, including access to the $2000 welcome bonus (up to 200%). This is a bankroll booster that can only be used once, by those who reload their account for the first time. The size of the bonus depends on the amount deposited, since the first investment is more then matched by the online casino. VegasMaster readers can enjoy an Exclusive Bonus of $3000 up to 300% - By Using the code "VEGASM" which is one of the biggest offers currently out there in the market. This Crazy Casino review will highlight the attention paid by the gambling operator to the needs of new players. On top of this cash award newcomers will also receive an additional 15% Payment Method Deposit Bonus for Ukash, Neteller, Skrill, PostePay, Giropay and Sofort users. Crazy Casino (also known as Crazy Casino Club) has the arguments that can convince players to make the transition from land-based casinos to online gambling. At the same time, it doesn’t stray too far from the proven concepts and games that make brick-and-mortar venues so popular. 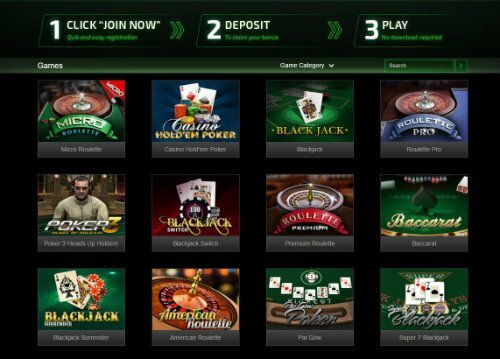 Betsoft & NetEnt along with other great software providers present here like NextGen Gaming and Thunderkick are famous for its slot machines in general and progressive jackpot games in particular (which are missing from this casino). They are also well versed in the art of producing video pokers, table games and scratch cards. All these genres are properly covered here. The NetEnt series of blackjack games can be played here, with double exposure, classic blackjack and Super 7 blackjack featuring on the list. These are also games that can be played against real dealers, just like Baccarat, BlackJack and Roulette. Multiplayer roulette provides the thrills of combining a popular table game with the adrenaline rush of tournaments. Sic Bo and Vegas craps are not compatible with live dealers but are nevertheless exciting. When it comes to gambling in general and online casinos in particular, you can never be too safe. Crazy Casino meets customers halfway by addressing the concerns regarding the random number generator. Those games that can’t be played against real dealers bear the eCOGRA Seal of Approval. This is a silent reminder that the independent auditors have taken a close look at the games and found the RNG fair. The Software developers performs similar verification on its own games before releasing them to online casinos. Once players put their concerns regarding the fairness of Crazy Casino aside, it is time to look at the defensive mechanisms. Outside threats are contained and repelled at each attempt of breaking through, by the 128 bit SSL encryption. There is always somebody trying to steal sensitive information or even better, the funds of law-abiding players. The security protocols are used by financial institutions which speaks volumes about their reliability. Due to a diverse offering in game developers the best titles can be found at Crazy Casino and the entire collection surges beyond 700 games. The compatibility with mobile devices is insured by the 1Click Instant Play technology, which makes games available in instant play format. Gonzo's Quest, James Dean and Pinocchio and are other popular Crazy Casino games belonging to the slot machine genre. Players who want to go mobile can do so and enjoy all these games on smartphones and tablets. Apple, Android, Blackberry and all Windows gadgets are compatible. Crazy Casino classic section for slot machines is a treat for those who wanna try a bit of retro gaming. Initially only a handful of Crazy Casino payment methods were available, but many more were added recently. One can use Visa, MasterCard, Neteller, Skrill, Postepay, Entropay and less comman systems like Sofort and ecoPayz to deposit and cash out profits. Credit cards are still some of the fastest alternatives, ahead of bank transfers, but they trail behind electronic wallets. Crazy casino online has a dedicated crew of specialists, ready to help those in need. If the FAQ section proves insufficient or you need a different answer, pick up the phone, write an email or use the live chat service. The latter has the advantage of offering direct interaction with an expert, without the fees associated to phone support. Players from certain countries benefit from toll-free numbers and will get to interact with someone who speaks their language. 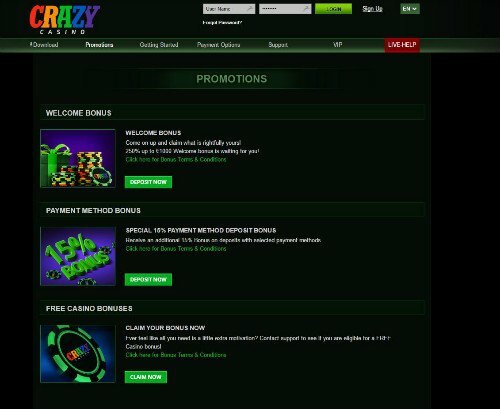 crazycasinoclub.com runs on offers great dependable gameplay which is always good news if you have second thoughts about the fairness of games. Multiple verifications are performed to ensure that the random number generator and the house edge are fair. The eCOGRA certification and their overall impressive track record are also solid arguments in favor of giving them a chance. They have been serving the audience for more than 10 years and no complaints remain unaddressed. With nearly 700 games to choose from, the odds of getting bored anytime soon are slim to none. The introductory offers and the Crazy Casino club bonus codes are more then good enough to keep existing players happy while expanding the customer base. Make sure to grab the Great Exclusive from Crazy Casino and let us know if you agreed with our review in the comments below.